Fried Tarantulas, bugs, worms anyone? 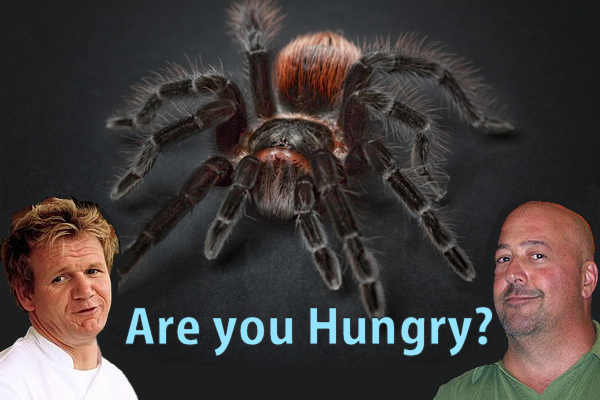 It has been said bugs have tons of protein, but would you eat Fried Tarantulas? Well, this “Bugs Cafe” in Cambodia serves Deep Fried Tarantulas… yes, there are other bugs too if you are still hungry… interested? Believe it or not, Canned Oven-Baked Tarantula is a unique delicacy of Cambodia. Some say it tastes pretty good, crunchy legs with some meat in them, a bit gooey in the middle, some say the flavor is between chicken and cod. It has been said they have calcium, iron, potassium, that they can improve your immune system. Don’t expect to wake up and be like Spiderman. Sorry, it won’t happen. Andrew Zimmern had to try them too. Andrew Scott Zimmern (born July 4, 1961) is an American television personality, chef, food writer, and teacher. He is the co-creator, host, and consulting producer of the Travel Channel series Bizarre Foods with Andrew Zimmern, Bizarre Foods America, and Andrew Zimmern’s Bizarre World. If you have not watched his video then here you will see how much he loved them.